Two gigs in one weekend at my time of life – all right, I’m only 33 for a few more weeks, at least – might be stretching it a bit, particularly in two different cities, with two different companions and an added visit to the parents with a three year old in between, but Wilco at the Roundhouse (Camden) on Saturday and Anna Calvi at Concorde 2 (Brighton) were well worth the effort and also, I think as the JavaTM cup of tea winks at me suggestively from the corner of the screen, worth an addition to the occasional blog. In many ways – the fantastic Mr Tweedy notwithstanding – the weekend was, partly by virtue of where I ended up standing, about two guitarists; or three, if you include Wilco support act Jonathan Wilson. For Wilco, Nels Cline came bounding on, long, loose and maroon shirted prompting Mrs Duck to turn and say: they’re really quite old, aren’t they. You’d never think Anna Calvi was a bit old – and certainly younger than the majority of the crowd at Concorde 2 – but between them they shared a sort of thin angularity that seems to make for the best guitarists. Indeed, both dragged sounds from their various Teles (Calvi), Jazzmasters, Danelectros (Cline) which seemed as outwardly angular and sharp. As you’d expect with a band with seventeen years behind them, not to mention a wide-ranging pedigree outside the day job, versus an up and coming artist, Wilco demonstrated more range over their two hours on stage, starting up noisy and dragging in a squall-of-sound as they built from One Sunday Morning through to Bull Black Nova without much pause for breath, before Tweedy finally took the chance to say hello. Tweedy himself was on powerful form, his voice fuller and deeper than on recent albums rasping out his oblique, ambiguous words; a rumble through the mix. Calvi started with the opening track from her eponymous album, standing to deliver a masterclass in the sort of clean tones you can wring the combination of single coils and Vox amp, summoning a storm in baroque, semi classical motifs, revelling in the space between the notes. There was to a simple, stumpy mind, a whiff of Buckley (jnr) to her performance; something in the vocal range, superb control of dynamics and ability to draw on an almost operatic vibrato at the top of her range. Or maybe it was the Gary Lucas-y magic guitariness that hinted at the opening bars of Grace (see the “Songs to No-one 1991-1992” version). Or it could just be that I’m aware that the co-founder of Domino Records (Calvi’s label) was at Big Cat and gets a name check in the Grace liner notes and I’m being fanciful… In any case, even with the guitar set aside (to rest a wrist injury), crooning an Elvis cover, Calvi is a magnetic presence. A third of the way through Wilco’s set, they are on what must surely count as one of the more spectacular party pieces in rock. With Tweedy and John Stirrat (increasingly prominent on backing vocals as the night progresses) picking up the rootsy vibe, Wilco pushed into their murder ballad Via Chicago only for, part way through the song Glenn Kotche to go into meltdown on the drums before the song bursts through back into the country air. Three times this happens, first with Kotche alone in the middle of his breakdown and then joined first by Cline and then by Stirrat and Pat Sansone to leave Tweedy gentle strumming through the carnage. Surely this is what Tweedy’s famous migraines must’ve felt like. Such is the brilliance of Wilco’s playing and unity as a band, that such musical coup de theatre are liberally scattered across a set that became more jovial and relaxed as it progressed, the audience warming from appreciation through to genuine love. It’s hard to think of another band that could inspire a large crowd to chorus the opening line “impossible Germany; unlikely Japan”. The culmination of this progression towards feel good was perhaps the appearance on stage for the encore of Nick Lowe, introduced by Tweedy as the Jesus of Cool, for a spirited reading of Cruel To Be Kind, with Tweedy and Stirrat singing back up vocals into a single mic like a later day McCartney and Harrison. Calvi’s encore then was The Devil, finding her standing apparently alone centre stage, holding the attention of the rapt Concorde crowd; and after that an Edith Piaf cover that drew on similarly devilish imagery before we all departed late into the Brighton night. 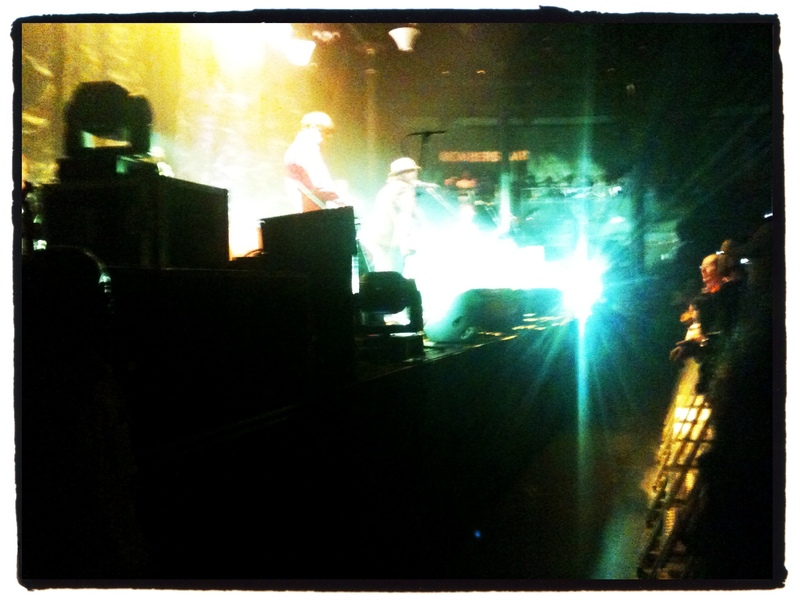 Wilco obviously benefited from the warmth of the crowd toward them and the substance of their back catalogue. They were musically superb, assured and apparently capable of rolling out any song you wanted with precision and drive. Calvi is more glacial and crowd more obviously musos than fans; occasionally, you maybe wish for a crack in the ice, a burst of emotion through the control and hauteur – her intersong chat, as minimal as it was suggested a shyness that the performance overcomes. But still she is a dynamic presence with a surfeit of ideas and the technical accomplishment to go anywhere. Overall, a hell of a weekend, and an excellent use of that extra hour.